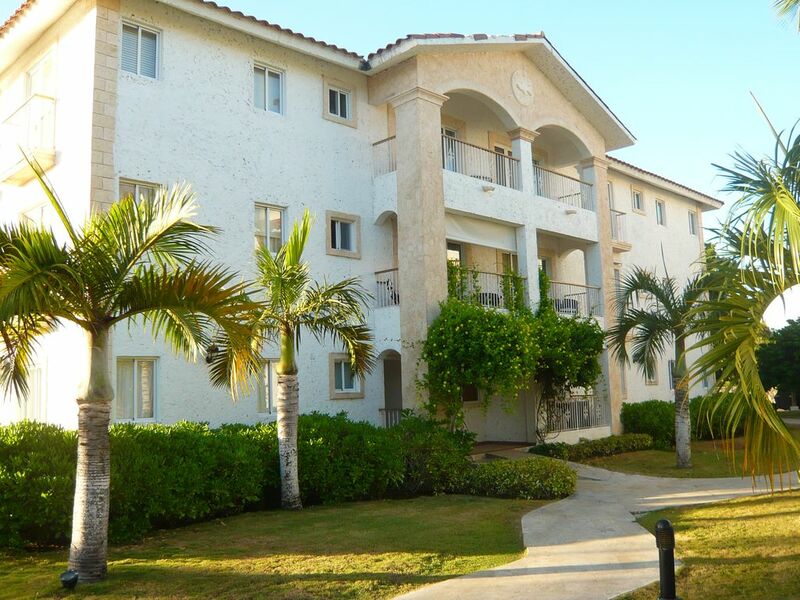 The PEZ 106 apartment is located inside the Cadaques Caribe private club in Bayahibe Dominicus. A complete kitchen equipped with electric stove for 4 pots, large fridge with freezer, microwave, toaster, American coffee machine, water heater for tea, full service of dishes, glasses and cutlery for 4 people. Dining room with table for 6 seats. Apartment located on the ground floor, accessible to disabled people with private terrace overlooking the magnificent garden of the structure and a few steps from the private beach of the complex. At guests' disposal free of charge there are also 3 swimming pools: one with an elaborate water park right at the entrance of the village that enchants children with slides and waterfalls, the tower and the sea creatures that splash; , a second wide with a suggestive bridge and bar and a third one next to the restaurant; a modern SPA (for a fee), restaurant with a la carte options or buffet or pizzeria, a restaurant with Mexican cuisine and a bar near the beach open until late at night; a Catholic church, a mimimarket and various boutiques. There is also the possibility to practice water sports such as water skiing, snorkeling, sailing, fishing and much more. The agreed prices are inclusive of Light, Internet connection and use of all the non-paid facilities of the complex, such as swimming pools, access to beach and pier loungers, beach towels. The other paid services of the complex are excluded as SPA, Restaurants and Bars, excursions and more. Cadaques Caribe is a perfect place for a family vacation! The community has an old world feel with plazas, beautiful beach, great pools and even a restaurant and mini mart. It was busy but never crowded. We were there over the holidays and yet we could always find beach lounges or pool chairs. There are many different areas to relax. The pier is also an enjoyable location. Our family enjoyed the many amenities such as the pool water slides and the inflatable one in the ocean. You don't have to leave the area! There were even beach soccer, volley ball and a nice childrens play area. Our owner Giancarlo was wonderful to work with. We had never been to the Dominican Republic and I must have asked him 100 questions and he answered every one patiently and promptly. The location of this unit is perfect. It is close to everything and yet very tranquil. The balcony has a beautiful view and we enjoyed eating and relaxing there. You can tell he takes pride in his property as things such as linens and cookware were nice. It was very clean and his manager Wendy was there as promised. We had 3 generations enjoying this area and would recommend it highly. Our grandchildren enjoyed a horseback ride on the beach arranged onsite and we enjoyed walking into the adjacent national park. We didn't rent a car but found taxi into Bayahibe easy for an evening. Many thanks to Joy and Angelo for the nice review and it was a pleasure to have them as guest.I am happy they were satisfied with the stay and that surely will keep a pleasant memory of the stay. modern apartment complete with all comforts in the context of the beautiful cadaques resort. I will definitely return here. Address : BOULEVARD DOMINICUS AMERICANUS , or as called on google map CARRETERA A BAYAHIBE. It is located along the Dominicus beach of Bayahibe , it is the last resort before to enter the Parque Nacional del Este. From Punta Cana airport ( aprox 50 min , 70 Km) you have to take the motorway (Autopista) to west directions Santo Domingo/LaRomana/Higuey for 58 Km. After the second toll payment you will find the exit for Bayahibe /Benerito. Take it and turn left directions Bayahibe. Always proceed straight for 12 Km ( do not enter Bayahibe , but stay on the street directions Dominicus) , and straight also when finding on your right the Dominicus district , and all resorts ( Catalonia, Dreams , etc) you arrive at the end of the street before to enter the Parque , you will have the Cadaques Caribe entrance. Your names will already be registered there. Then you have to proceed to the condominium / administrative office to check in. They will record your arrival with an identification document. They will show you where the apartment is located. There is free parking for you.